Over the past few years, Ohio’s CTE Pathway Tests have been transitioning to a new model of End of Course (EOC) Tests from two older models: Modular Tests or End of Program Tests. 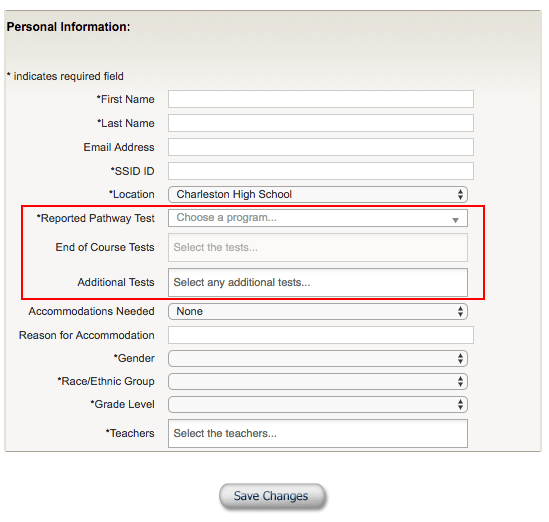 In the new model, a Pathway Test consists of multiple EOC Tests taken by students at the completion of an ODE CTE course. To best prepare your students, it is important to review the ODE course outlines documents linked from each career field page. EOC tests are designed to cover the material covered in the ODE course outlines. It is important to assign the correct Pathway Test to students. The authoritative document on which Pathway Test to give is the Ohio Department of Education’s CTE Assessment Matrix, available for download at http://education.ohio.gov/Topics/Career-Tech/CTE-Assessments-and-Industry-Credentials. An excerpt of the CTE Assessment Matrix is shown above. Districts can look up the CTE Program of Concentration on the left side of the matrix. There are two columns for the Pathway Test. One column is for seniors in programs that are not new. The second column is for juniors or any student in a brand new program. In some cases, seniors and juniors may have different Pathway Tests to take. In the example above, the Information Technology Pathway Tests are in the first year of field testing. Seniors should finish taking the old 81MC modular Pathway Test. Juniors should begin taking the 81MD EOC-based Pathway Test. Identifying and taking the correct Pathway Test is important. Tests may change year to year as older Pathway Tests are updated and replaced. During the rollout of a new EOC-based Pathway Test the older test is made available for an addition year for the seniors, after the additional year the old test is retired and no longer available. So, for example, if juniors begin taking the old tests marked in the CTE Assessment Matrix as “senior only” and are about to be retired, they will not have an opportunity to retest in their senior year, because the test will be retired. Districts instead should be sure to test juniors with the appropriate test, as directed by the Assessment Matrix, and the students will be able to retest the next year as seniors. WebXam supports state wide testing of Ohio’s Career-Tech Education (CTE) pathways. Manually assigning tests is different for students in pathways that are in Workforce Development verses non Workforce Development (FCS programs). We are providing this explanation and these procedural guidelines due to many Ohio CTE instructor inquiries received via phone and email. CTE testing is based on ODE-designed pathways. A pathway is composed of a number of 40-item tests that cover a career field. In order to pass the pathway, Ohio CTE students must take the minimum number of tests required by their chosen pathway and score higher than the pathway performance standard (aka benchmark, cutoff score). Individual Ohio CTE Workforce Development pathway students (this excludes FCS) in WebXam must be assigned an overall pathway test. The assigned overall pathway test is referred to as the student’s reported pathway. Any test taken in the student’s assigned pathway will be counted for the overall pathway score and will be reported to the state at the end of the year. Failure to mark the student’s overall pathway correctly can result in incorrect data reporting. The graphic below highlights the fields used in assigning WebXam tests.